Much like in card games you can count what the percentage chance of a certain dice being in your head is. A lot of the times you’ll be drafting dice into your ‘deck’ and you’ll be aiming for the stronger dice to pull into that draw, but there is one thing that sometimes gets forgotten by a lot of players and that’s the ability to draw quiddity to be able to keep rolling your ‘deck’ forwards. As such always think (especially when you don’t have enough quidity to buy the ‘strong’ dice) about the weak cards(spells especially) that have a hight quidity ratio on them as filler for your deck. A spell that has an ok effect + quidity and high quid values on 50% of it is a great buy for example if this is your goal. The one rule of Quarriors that never caught on with me is ending the game when 4 creature cards in the Wilds are empty. While most of the rules of the game flow seamlessly with the theme, this one just doesn’t make sense to me… why would summoners quit battling when their summons are healthy, just because they’ve summoned most of what’s available? I have completely ignored this rule since my 2nd or 3rd game. It helps streamline the game, because it’s one less thing I’ll have to be mindful of. And at the same time, it will almost never change the outcome; I’ve noticed only once or twice where 3 cards have gone empty, let alone 4. I do understand that this rule adds a potentially neat strategy for players with “weak” dice bags… if you know your opponents have Questing Wizards and Quake Dragons, and you’re sitting on a bunch of Goblins and Ghostly Spirits but up by 4 points, it behooves you to end the game now before they overrun you, which they certainly will. The problem is that, even in a 4 player game, it’s highly unlikely that the supply of dice representing 4 creatures will ever be low enough to need just 2 or 3 more purchases to win. My dice bags usually end up with between 9 and 11 dice in them… at most, 5 of them are creatures purchased from the Wilds, with a few portals, a spell and some Quiddity. Unless somebody in your game is trying to build a 20-die bag from the onset, there’s likely not going to be enough creatures gone to let you execute on a “trigger the end early while I’m up by a few points with my low level creatures” strategy. 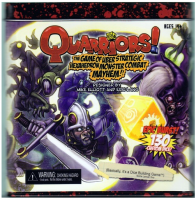 Finally, the most frequent complaint I hear about Quarriors is that it ends just as you’re really excited about the dice in your bag. Eliminating this rule makes an early end less likely, and may give you a few extra turns with that built-up bag. The game isn’t going to take longer than a half-hour anyway… no need to rush things! One thing that seems counter intuitive at first to some players is the idea of Culling dice, the act of removing dice from your bag forever. You may Cull 1 dice for every 1 creature you have scored with, but its sometimes hard to remember that you will want to Cull. Why Cull? Simple – you are getting rid of the fat. Think of your bag as a human body. If you don’t Cull, its a lot like you’re sitting on the couch, watching TV and eating pizza. The bag will get fatter and fatter and it becomes much more difficult to draw the dice you want to actually draw (spells, creatures and so forth). If you Cull, however, its a lot like you training your body for an Olympic event – making it leaner and tougher. Good things to Cull would be the Quiddity dice you start with and the brown dice (forget their name at the moment), but also even Corrupted Quiddity when you have the chance. Our house rule is that we always play to 20 points, but we add an extra creature and spell card into play for each extra player beyond 2. So 2 players is the standard 7 creatures, 3 spells. 3 players gets 8 creatures, 4 spells. and 4 players gets 9 creatures, 5 spells. I do not recommend this strategy simply to win the game at all costs, mostly because I do not like strategies that ignore everything else on the board in favor of one thing, but the simple fact of the matter is that if one person picks up 4 or 5 of the Defenders of the Pale when they are in the game, it will be nearly impossible to stop them from winning as those buggers are really hard kill. I in fact encourage my opponents to purchase them when given the opportunity. The faster they are bought up, the sooner I can focus on purchasing spells and other creatures without worrying about one of my opponents running the table with that one creature. I really don’t want to win this game because I bought everything of one creature either. GET RID OF YOUR DICE! If you delay too long at the beginning and don’t cull your dice, you’ll start rolling only small creatures and/or not having the quiddity to bring out your big guns and you will die a slooooooow and painful death. Some of my best games have been ones where I replenish my bag every other turn….though once I did get a bit excessive with the culling and only had 7 dice in my bag…that didn’t end as well. Buying the highest price dice you can afford is rarely the wrong strategy in Quarriors, however you do want to watch out for some exceptions. Any dice that allows you to draw extra dice from the bag or sends dice immediately to your Ready area should be targeted for early purchases. Hand extension is crucial for deck construction games and it is no different for this great dice construction game. The more dice you are rolling or have access to each turn the more times you will win. Relatedly, that is why the Portal is always a good purchase option as are some of the spells. One of the problems we’ve run across with this game is that if one person is on a roll (pun intended 😉 ), then the game can be over rather quickly and you didn’t even get to use half your dice. We’ve tried a couple of different things to help with this. Extending the Game: This one’s easy. Instead of winning when a certain number of points is reached, make it only when 4 (or more) of the decks are gone. This can give people a chance to catch up from behind, or finally get to roll that dragon dice. Shopping Spree! : We house ruled that if you roll only Quiddity and no creatures, you get to buy two dice. A lot more fun, but not suggested for 4 players, the dice dissapear far too quickly. I have found that using a “lazy Susan” in the middle of the table to hold all of the ‘wilds’ cards and dice is a great help. Everyone can just turn it when it is their turn to buy, rather than having to read upside down. Just make sure that you don’t turn it too fast! These can be found online, Wal-Mart, and even made pretty simply. I use this stragegy about half the time that I am playing and it seems to work out very well. I don’t worry about getting creatures into my ready area early in the game as much as I do about my structuring my dice pool. Grab up as many of the portals as you can as well as any spells or creatures that let you draw extra dice from your bag. When you do start scoring (and culling) get rid of one assistant first and then a Quidity next. I alternate back and forth until all of my assistants are gone. Pick up a few defenders of the pale along the way and you can cycle through some pretty mean mid-game pulls while keeping your opponents creature light. The portals will help you draw into your creatures faster and having less assistants and quidity will increase your chances of drawing something useful every turn. Most opponents will go for early scoring, but without the portals they can’t get those creatures out every other turn. Of course, you need to watch what creature and spell dice are available because there are a few that will shut down this strategy. Don’t worry about running out of dice that you can get quidity from. The game will be long over before you can cull that many dice.